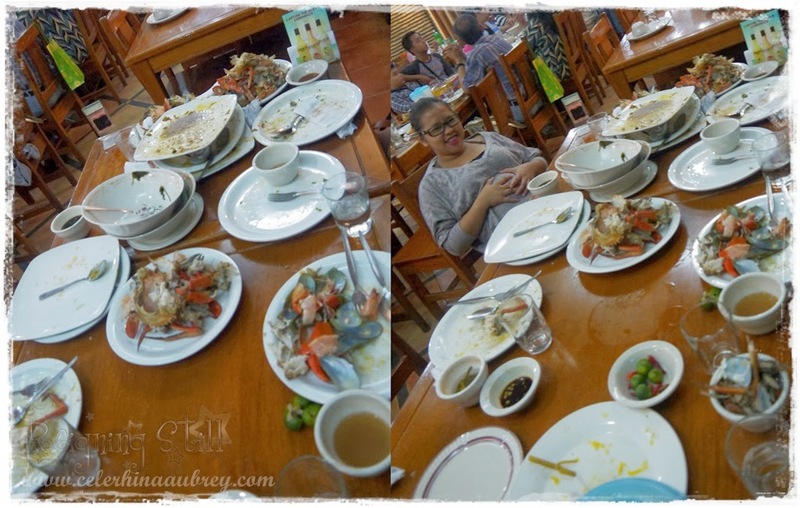 A couple of weeks back, my friends and I braved the heavy rains for some crabs and shrimps in Dampa along Seaside Macapagal. I have been craving for Baked Tahong for some time now and sissy also want some crabs so we went ahead. For those of you who are not familiar with the "Dampa" concept - you need to buy the main ingredients of the food you want to eat on the market. They have all types of seafoods - fishes, clams, crabs, shrimps. After buying those, you have to choose a restaurant where you do "paluto". The restaurants are responsible for the cooking all the seafoods you got from the market. Me and my friends usually go to Trinity. I haven't tried the other restaurants yet coz I really liked Trinity. They serve the best Sinigang and Baked Tahong. They also offer reasonable prices for the paluto. Their prices are on a per half kilo basis by the way. So it's best to dine there with your entire family coz it's cheaper if you have them cook food in bulk. We had Buttered Crabs in Oyster Sauce. We bought huge crabs from the market, 1 for each of us. I guess each crab weighs half a kilo. Ang saya! Super laki and so delicious. It was cooked well and the butter and garlic sauce is just yummy. They also serve the crabs cracked already so it's easier to eat. Of course, Baked Tahong. We got 1 kilo of it. And promise! It was the best. Tahong oozing with cheeze is just heaven. Pure heaven for me! Sinigang na Hipon is also on the menu. We got 1 kilo of shrimps and had half a kilo of it for Sinigang. It was raining hard that day so this is perfect to warm up our tummy. I love the way they cook Sinigang also. The acidity is just perfect and they had generous serving of vegetables. Parang lutong bahay. Shrimp Tempura of course is present. The other half kilo of shrimp was made into yummy tempura. It was my friend's request. I'm not really a fan of tempura because most serve them with so much breading and so little shrimp, but Trinity's tempura is appeals to my taste buds. The breading is not overwhelming and you can really taste the shrimp. Everything was just perfect. There are only 4 of us who attacked all of those and this is our final verdict! This is really my happy place. If you're a seafood lover like me, go and visit Dampa in Seaside Macapagal and you'd definitely enjoy it. Best if you're with friends or the entire family. You can all enjoy the seafood feast. **Ang mahal!!! :) 4 lang kami nyan syet!! Hahahahaha.. But I think 10pax could enjoy that feast. The crabs alone are too much!! 2 of my friends didn’t eat rice actually and just enjoyed the seafood. Kasi nga na excite kami sa pamamalengke. :) Next time, I had to bring the gang!